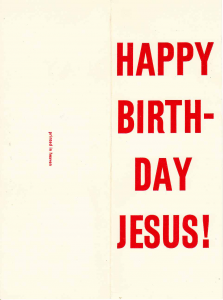 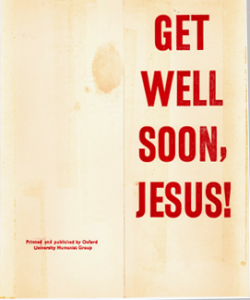 At the end of Michaelmas 1963 OUHG printed its own Christmas card – or rather, a birthday card for Jesus: it read on the outside Happy Birthday Jesus! 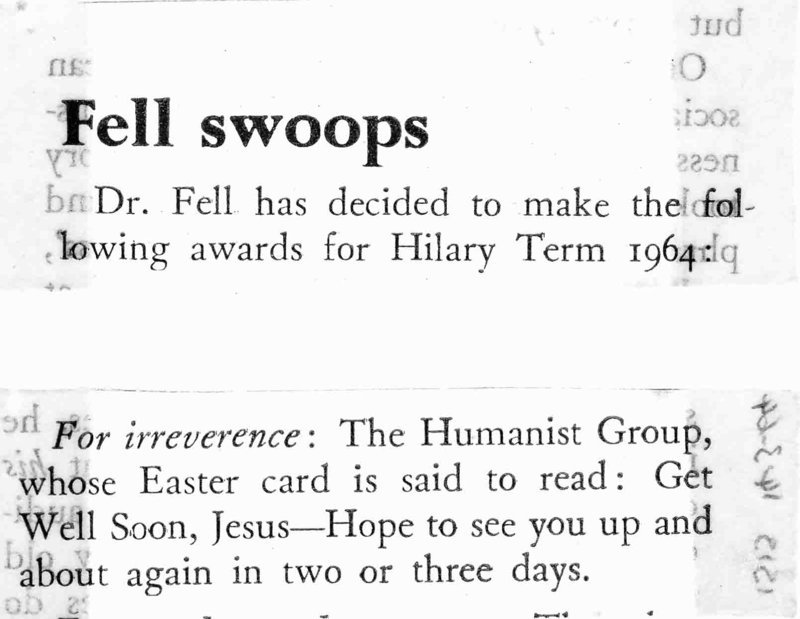 and on the inside 1963 today! 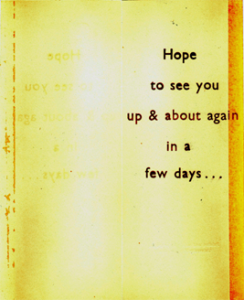 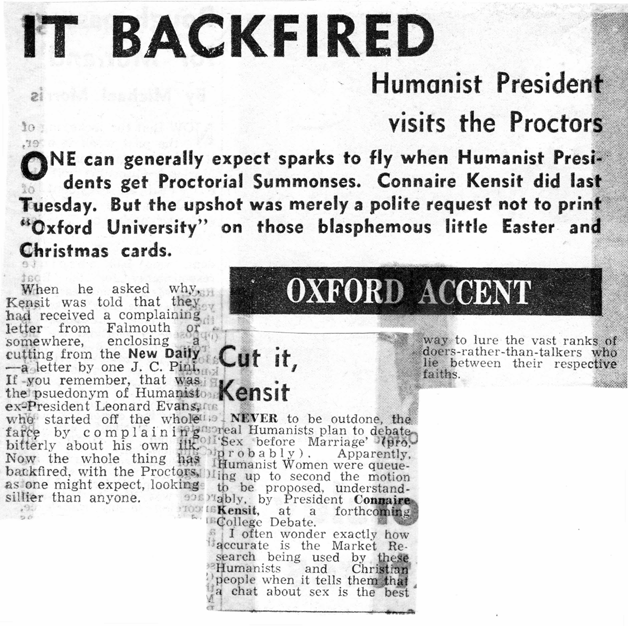 The cards (“printed in heaven”) were used internally but some, with envelopes and a pencilled ’1/-’ price, were inveigled into the rack at W H Smith’s in the Corn. 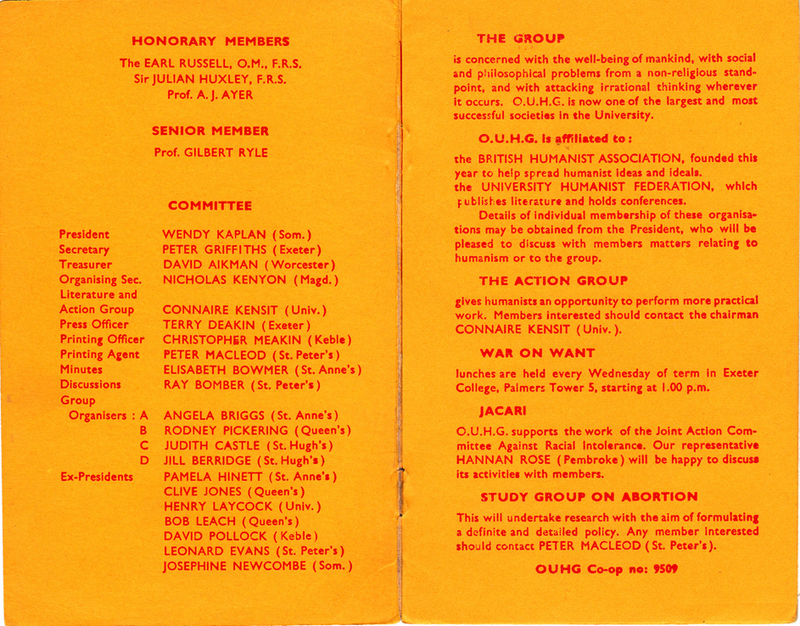 Connaire Kensit was president, Michael Lockwood secretary and Jill Berridge treasurer. 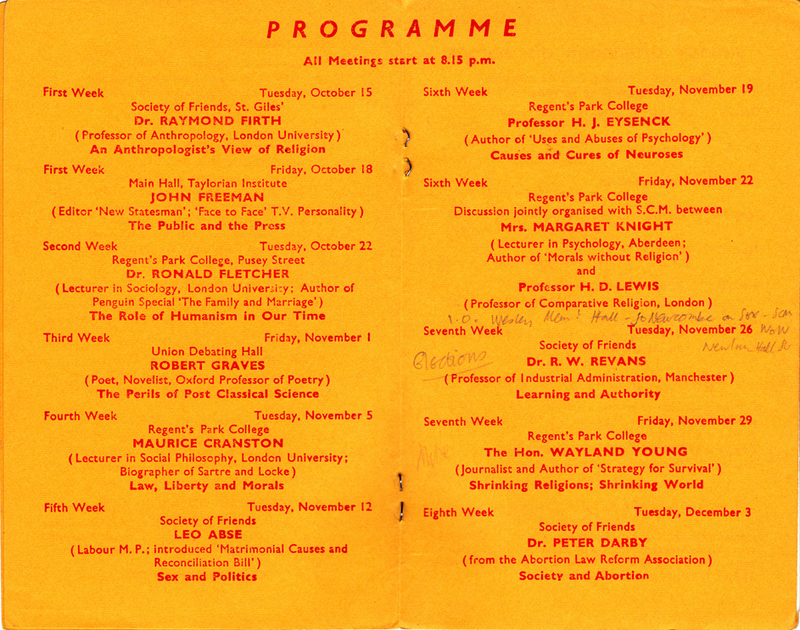 Speakers included Reginald Paget MP, A H Halsey and C P Snow. 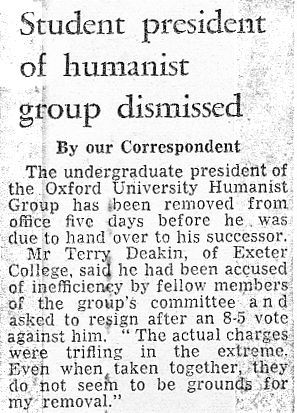 Terence Deakin was president, Connaire Kensit secretary, and Norman Stockman treasurer. 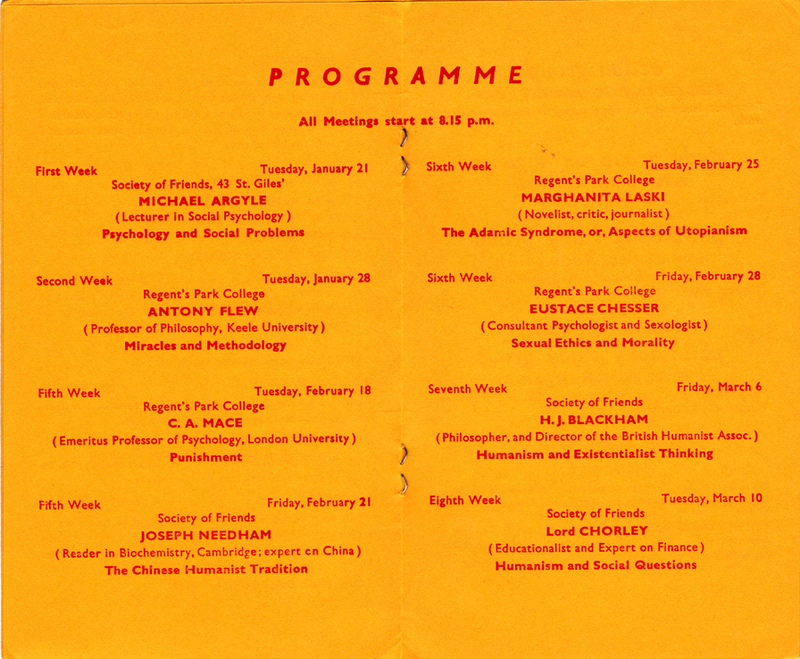 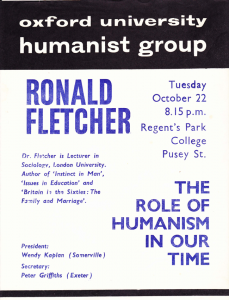 Speakers included Antony Flew, Joseph Needam, Marghanita Laski and Eustace Chesser. 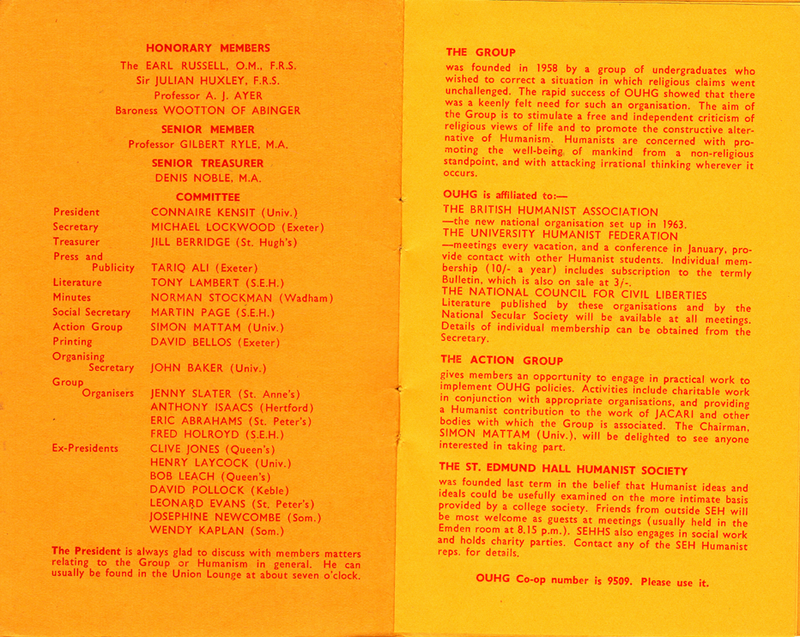 This was also the term of the evangelical OICCU mission to the University, to which of course OUHG mounted a campaign of opposition. 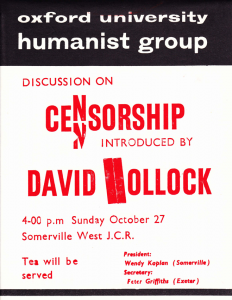 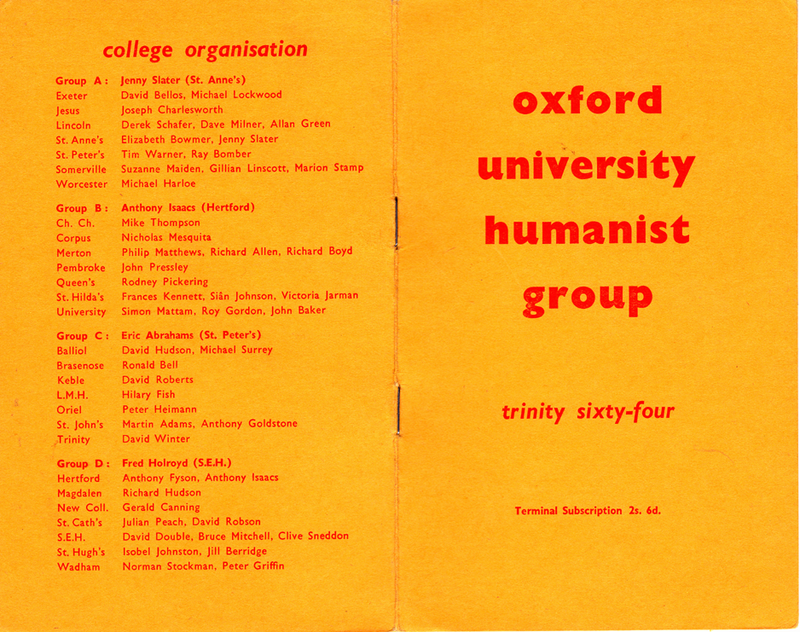 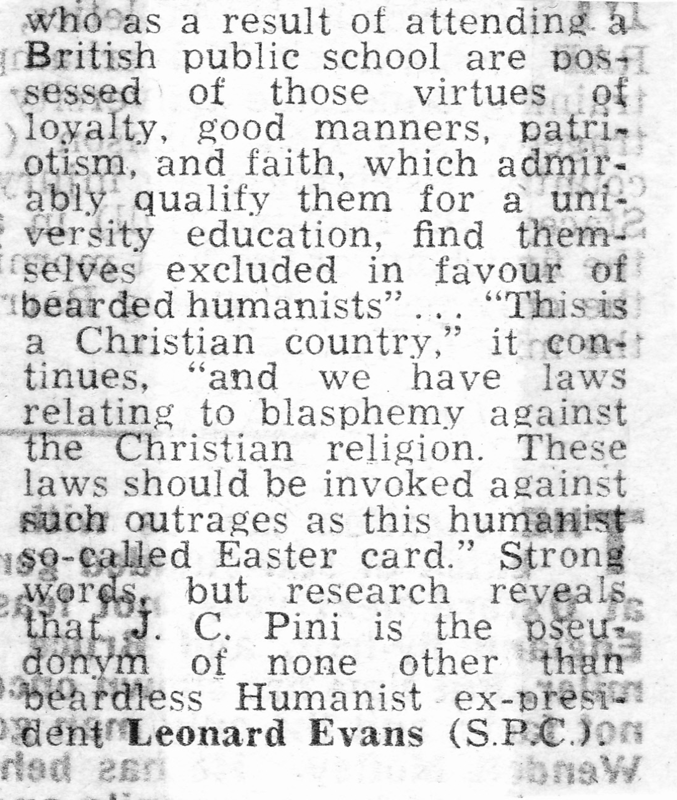 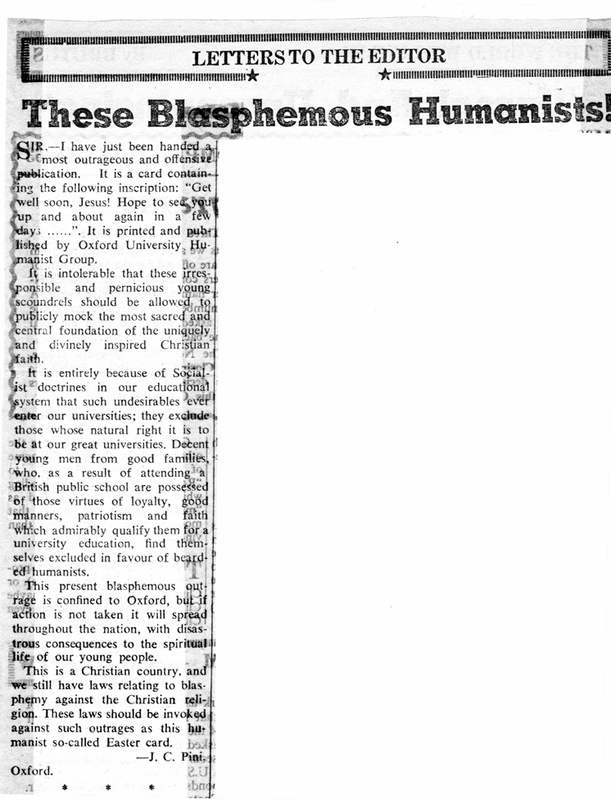 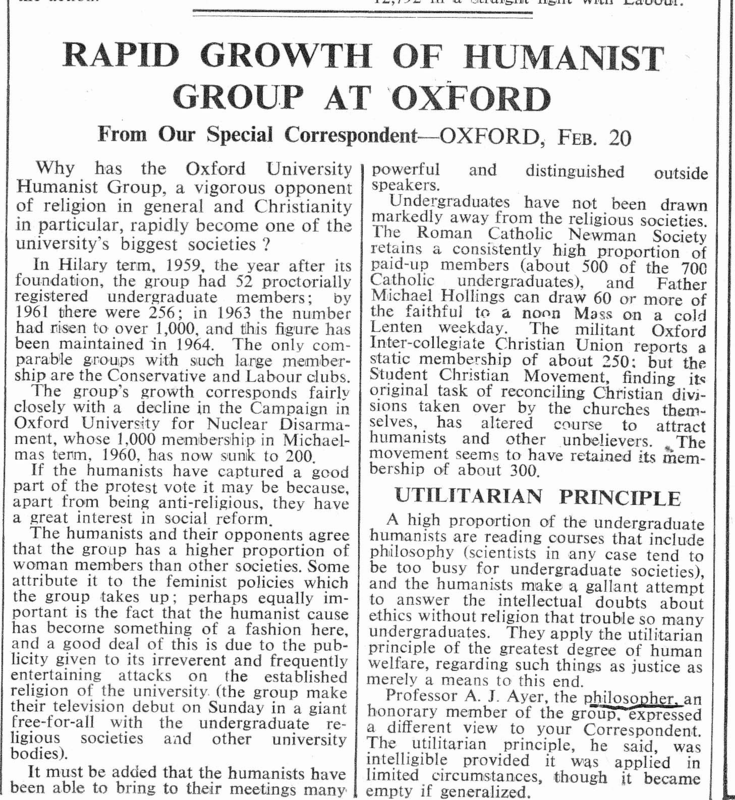 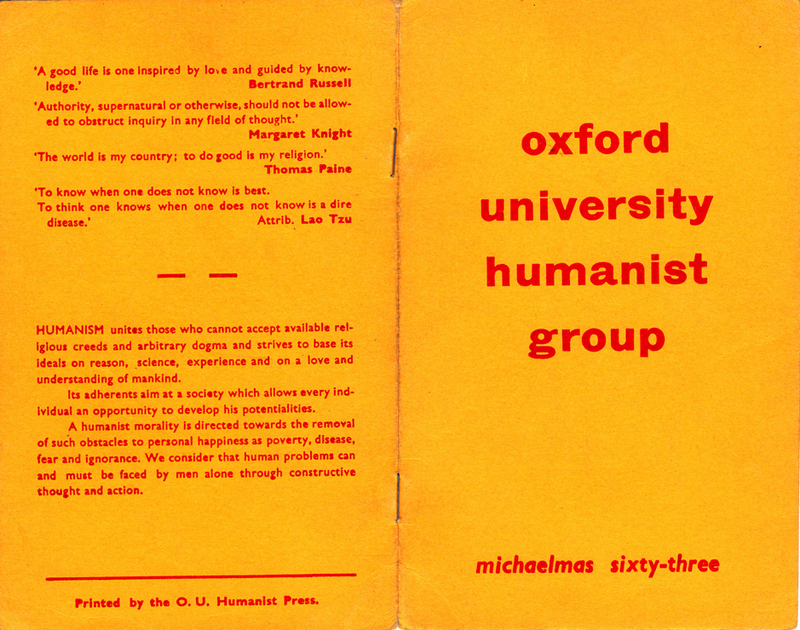 At the other end of the ecclesiastical spectrum, Christopher Hollis wrote at length about the Oxford Humanists in The Tablet – and OUHG Group Organiser Micke Lockwood replied eloquently and devastatingly. 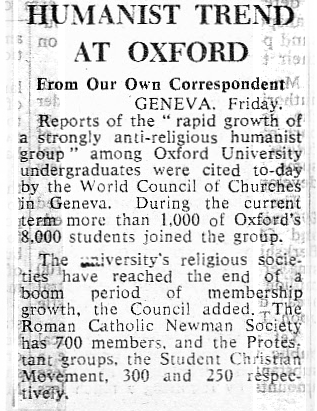 And it was the term in which the World Council of Churches and The Times took special note of OUHG. 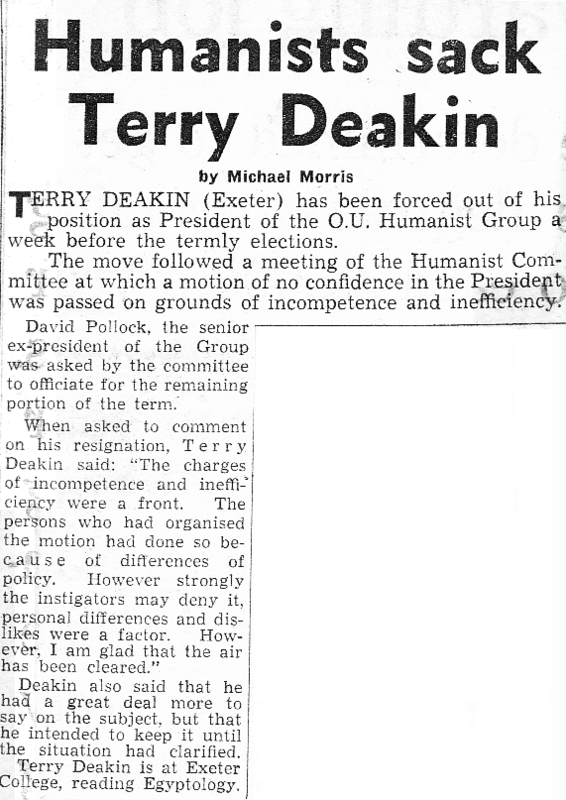 Near the end of term Terry Deakin resigned after a Committee vote of no confidence by the Committee on 1 March; Connaire Kensit took over as President for the short remainder of term (contrary to the report in Cherwell (4 March 1964), below, and Mike Lockwood became secretary. 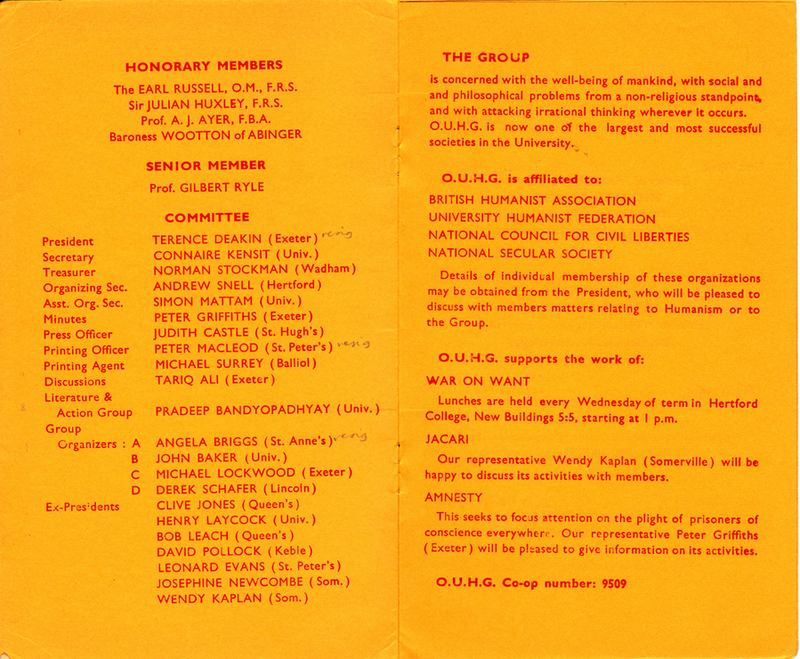 Peter Griffiths was secretary and David Aikman treasurer. 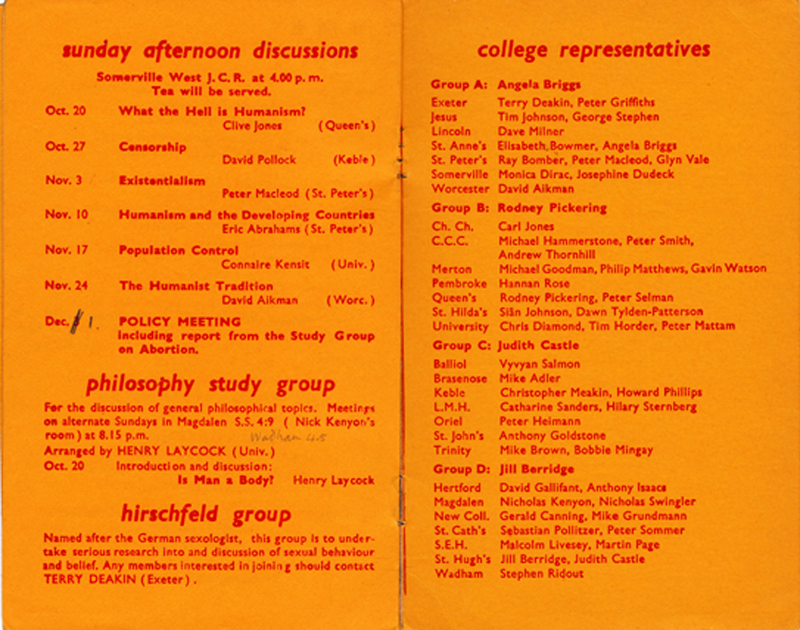 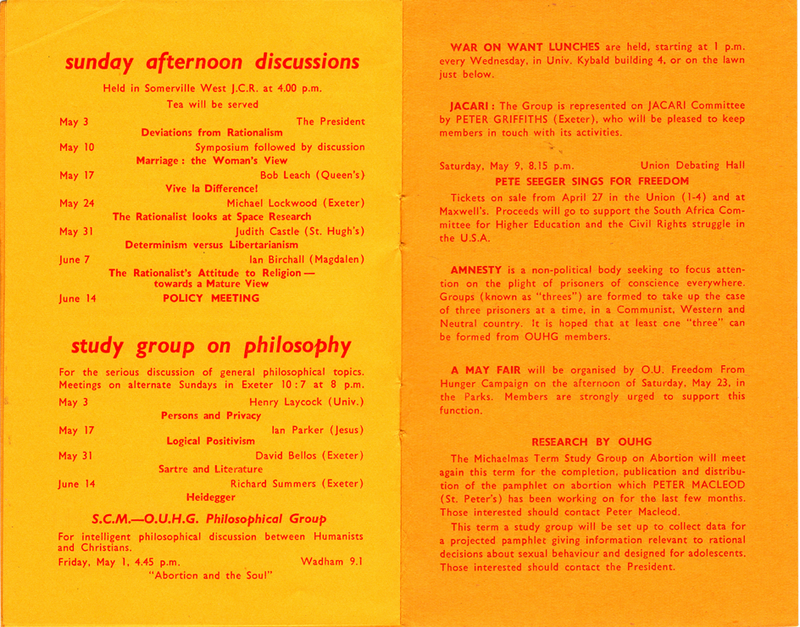 Speakers included Raymond Firth. 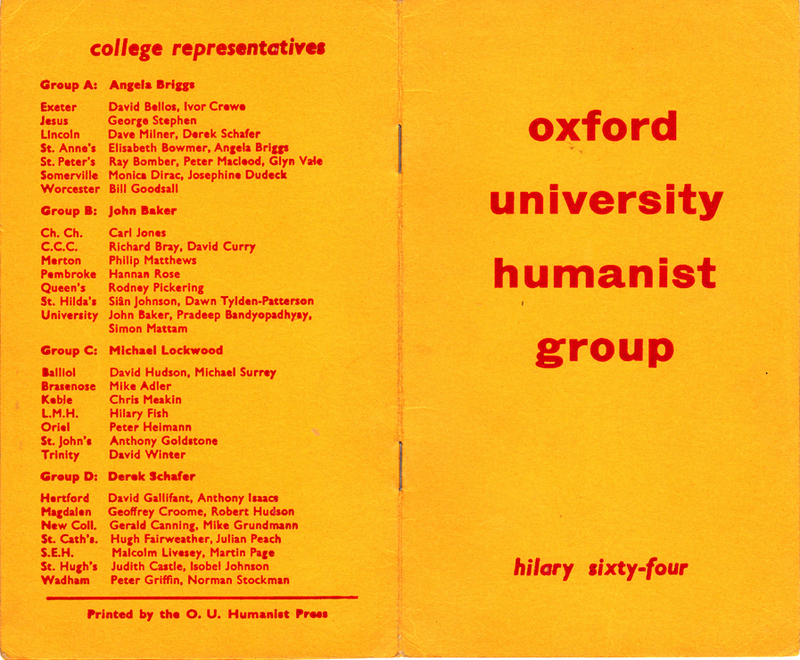 John Freeman, Ronald Fletcher, Robert Graves, Leo Abse MP, H J Eysenck and Margaret Knight. 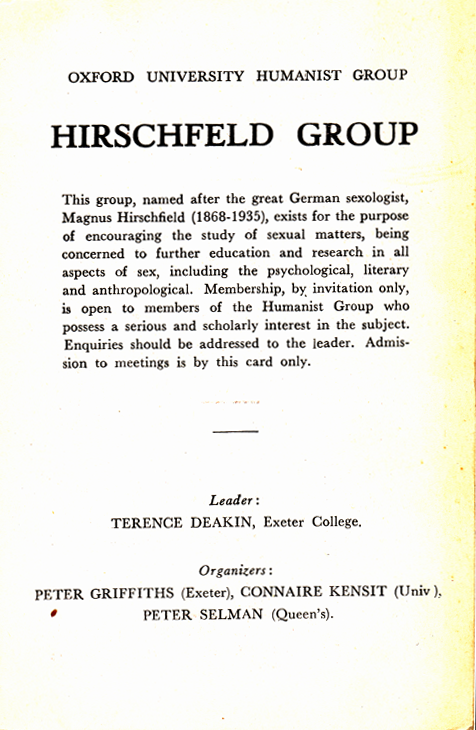 The term saw the creation of the short-lived Hirschfeld Group to study sexual matters, led by Terry Deakin, who had the previous term been in battle with the British Library seeking open shelving for its collection of erotica. 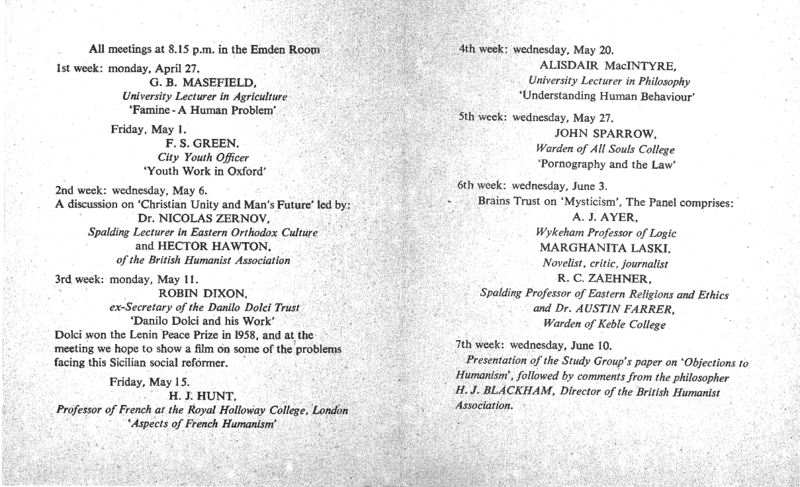 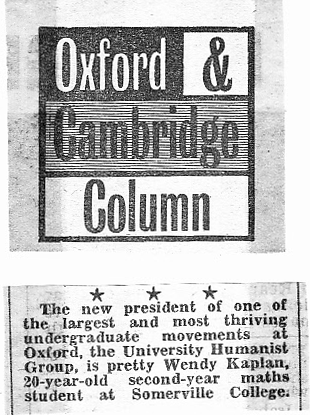 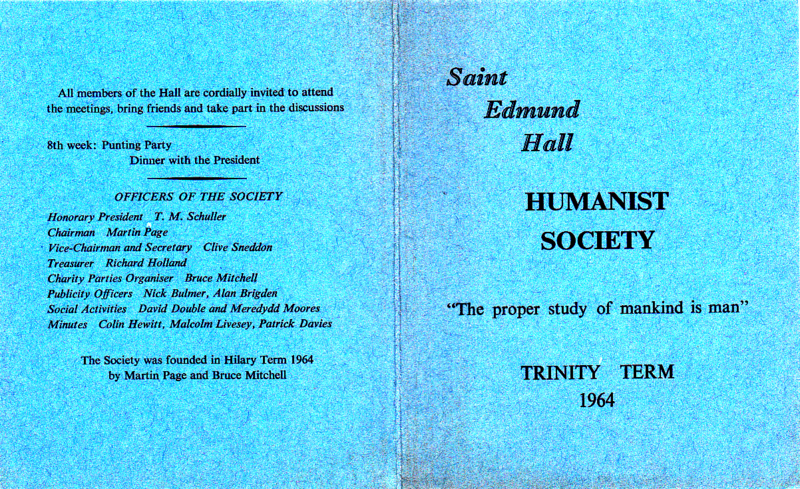 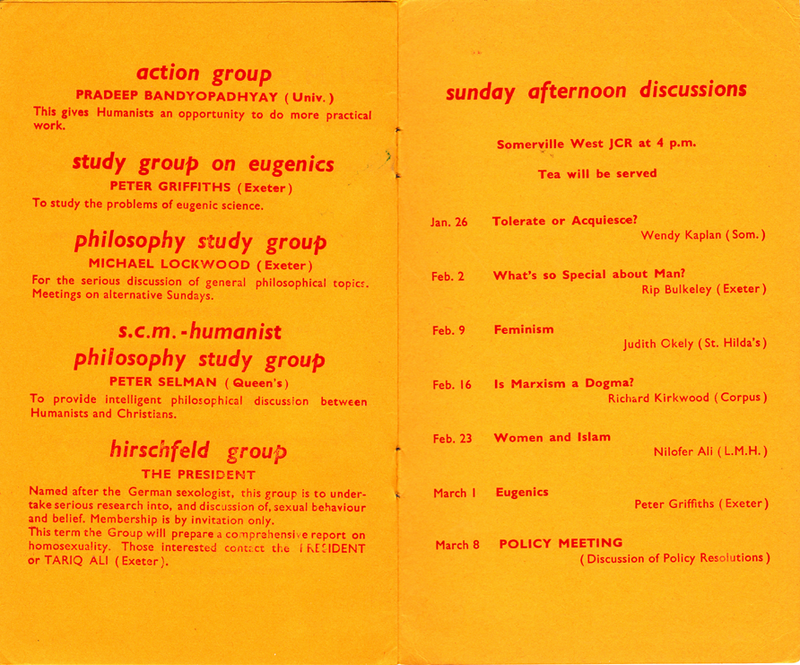 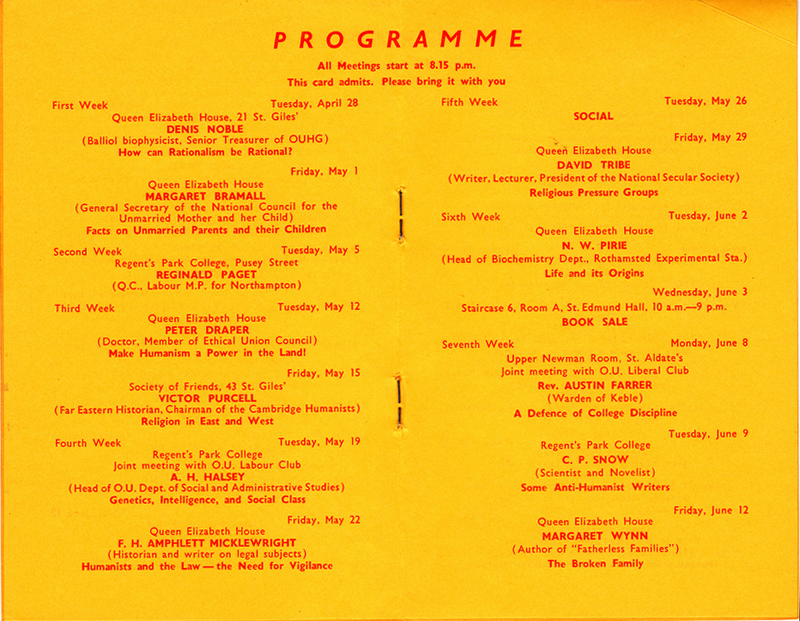 OUHG advertised its programme in Cherwell and received much press coverage for its meetings – see here. 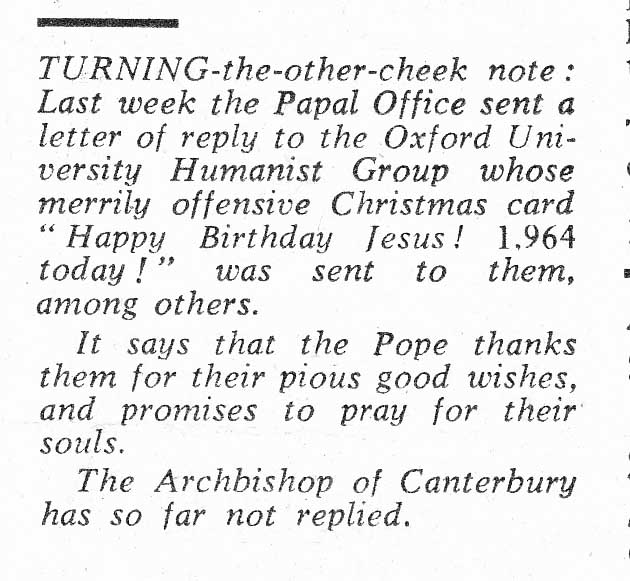 At the end of the term OUHG printed its own Christmas card – or rather, birthday card for Jesus: it read on the outside Happy Birthday Jesus! 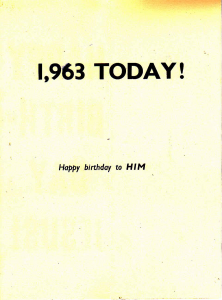 and on the inside 1963 today! 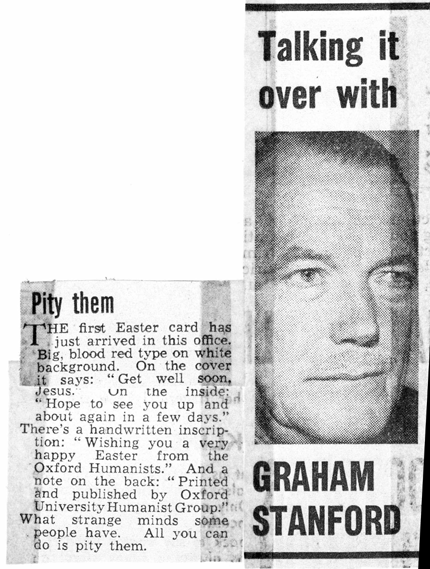 The cards were used internally but some, with envelopes and a pencilled ‘1/-‘ price, were inveigled into the rack at W H Smith’s in the Corn. 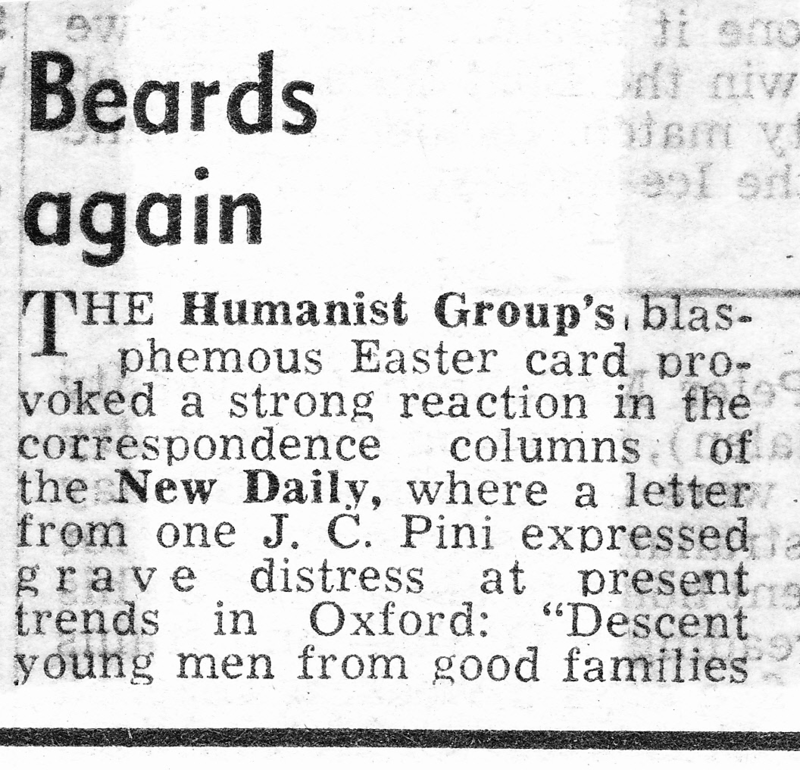 The story of this and the Easter card that followed is told here.